For a week after the Nobel news broke, there was prolonged silence, then a single acknowledgement on Bob Dylan’s webpage of his receipt of the esteemed award. The Internet went crazy with speculation. What took him so long? Should Dylan, who is pro-peace, even accept an award funded by money gained from dynamite, one of the most destructive discoveries of the modern world? But these questions may be moot because as quietly as the words appeared on his website, they disappeared just as quietly, prompting more speculation. Has he grown weary of accolades? Bob Dylan was on stage in Las Vegas during what fans have called his “Never-Ending Tour” when he learned of his latest and most impressive accolade, the Nobel Prize in Literature. He is the first to receive this recognition for songwriting. The honor, along with its $905,000 cash prize, was presented for “having created new poetic expressions within the great American song tradition.” Sara Danius, the Nobel academy’s permanent secretary, during the announcement press conference provided Cliff’s Notes on how to approach the newly minted Nobel Laureate’s work, advising them to review 1966’s Blonde on Blonde album, one of the most iconic works in rock music. In the Nobel tradition, competitors will not be revealed for fifty years, but it is believed that Dylan beat out American novelist Don DeLillo, favorite Haruki Murakami, Kenyan writer Ngũgĩ Wa Thiong’o, and Syrian poet Adonis. The last American to receive this award was Toni Morrison. 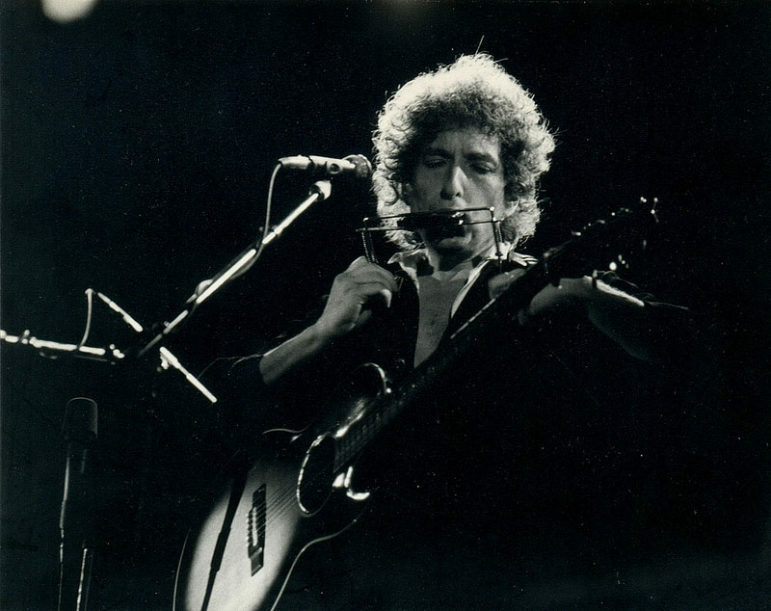 Bob Dylan—Robert Allen Zimmerman, as he was born—has been rewarded for his talent with eleven Grammys, a Golden Globe, and an Academy Award. He was awarded a special Pulitzer Prize citation for his “profound impact on popular music and American culture, marked by lyrical compositions of extraordinary poetic power,” joining the likes of George Gershwin, Duke Ellington, John Coltrane, Hank Williams and Thelonius Monk. In 2012, he received the Presidential Medal of Freedom. At the White House presentation, a somber Dylan allowed President Obama to present the award then strangely patted the president’s shoulder and returned to his seat. “You know, sometimes a person’s reputation can be far more colossal than the influence of the person,” he said. “I don’t pay any attention to it anymore.” It is widely held that, privately, he found the “voice of a generation” tag burdensome. November 11th of this year will see the release of his latest and most significant album to date. “Bob Dylan: The 1966 Live Recordings” is a 36-CD box set of every known recording from his 1966 concert tours in the United States, the United Kingdom and Europe. Possibly, he is saving his commentary for then. He does understand the value of marketing and advertising, having appeared in numerous commercials over the years, including for Chrysler, Cadillac, Pepsi, and Victoria’s Secret.